Unsweetened cocoa powder adds a rich chocolate taste to hot cocoa as well as brownies, cakes, cookies, and other baked goods. It’s made from roasted, dried, and ground cocoa beans. The final result is a fine, dark brown powder. Note: Unsweetened cocoa powder should not be confused with powdered cocoa mix or instant cocoa mix. Instant cocoa mix is for making hot chocolate drinks and should not be substituted for cocoa powder in recipes. 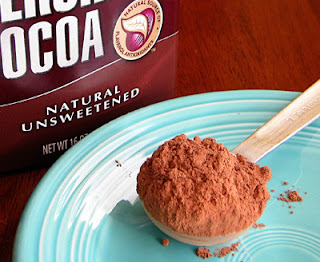 Spoon cocoa powder into the measuring cup like you do flour; with a light touch…then leveling off. Store cocoa in a sealed, airtight container in a cool, dark place. It will keep for up to two years. Learn more about unsweetened cocoa powder at Hershey’s and Baker’s websites. Next post: Our Homemade Hot Cocoa recipe calls for a dash of salt. I can hear you asking “What’s a dash of salt?” We’ll find out.